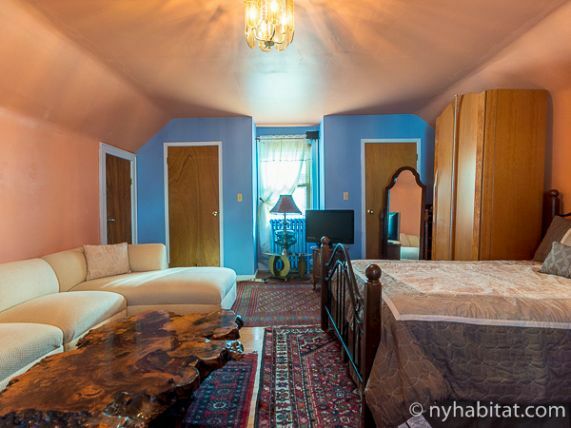 Jamaica, Queens is in hot demand right now. Filled with a diverse array of cultures, Jamaica is a wonderful place for families and people looking for a tight-knit community. If that sounds like what you're looking for, this two bedroom apartment might be perfect for you. 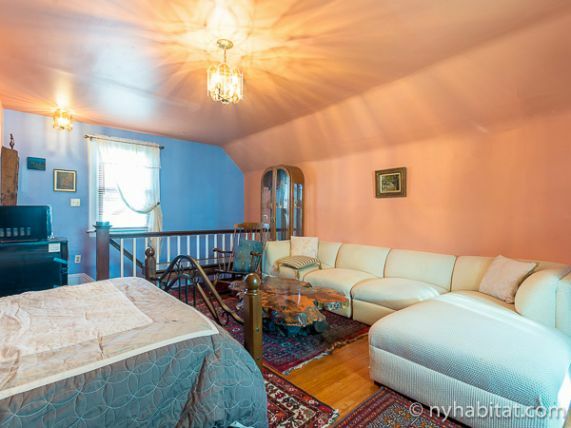 This Tudor-style house on 152nd Street and 85th Avenue sits in the more suburban enclave of Jamaica Hills. 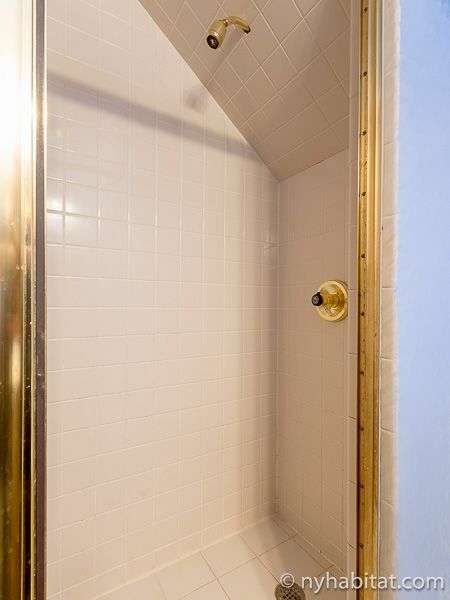 This two bedroom apartment share is on the second and third floors and has rooms for rent with shared living spaces with one roomate. 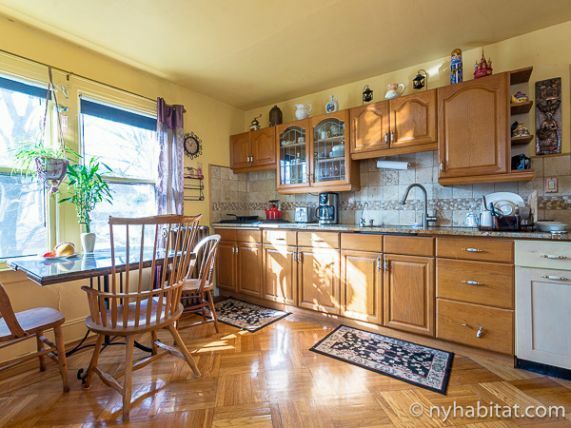 The kitchen is painted a soft gold in an American country style with colloquial pine cabinets and granite countertops. Bowback chairs line the dining table and wrought iron knickknacks tie the room together. 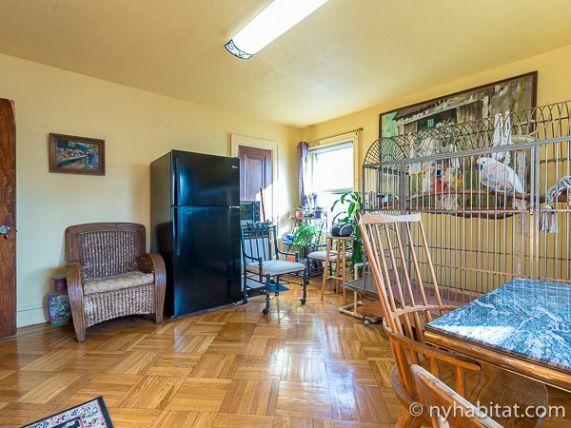 Please note that the kitchen is home to your third and fourth roommates: two parrots which make this an ideal apartment for the animal lover. 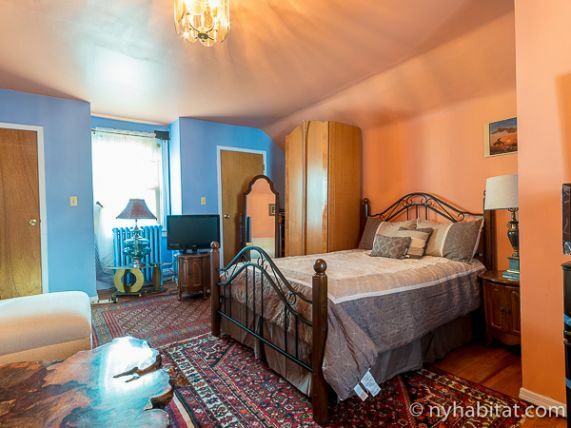 The first bedroom takes up the entire third floor is painted in cheerful sherbet tones. Inside is a full sized bed and wrap-around couch with a fascinating teak abstract coffee table that makes for a great conversation piece. This bedroom has its own private, newly remodeled bathroom which means no lines with your roommate. 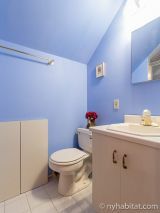 The second room for rent has a slightly more intimate atmosphere as it is painted in a dusty rose with a matching carpet. In this room there is a king size bed, flat screen television, and home gym for strength training. You can access the rest of NYC in a pinch with the E and F trains from Parsons Boulevard / Hillside Avenue station (0.3mi/550m).